Network of roads in the Olympic capital is 5 to 6 times smaller than Russian average – only 0.7 km per 1 sq km of territory. And only 25% of 2400 km or roads comply with modern safety requirements. * Construction of the road parallel to the main – and the only – road through Sochi’s center – the Kurortny Avenue – has just been started. It is not the service road around the city. This road is one of the “Olympic” projects. The road will be 17 km long, 6 tunnels are planned (digging of the first starts in January), and total cost just under $1 bln. Estimated completion – year 2013. * You can now enter center part of Adler from round-about near the rail-road crossing… under the rail-road! The railroad has been closed, at least for now. This area has been under heavy construction since last summer, giving a lot of headache to local residents. But I hear some good feedback on this recent change from my friends. The information about traffic conditions has long been available to the drivers in some larger cities in Russia, like Moscow and St.-Petersnurg, via Yandex Traffic online & mobile services. Now similar service comes to Sochi, but it will only be useful if the road network will greatly increase. The global design practice Populous is delighted to announce today that it has been selected by the State Corporation ‘Olympstroy’ to design the main stadium for the 2014 Winter Olympic and Paralympic Games in Sochi, Russia. 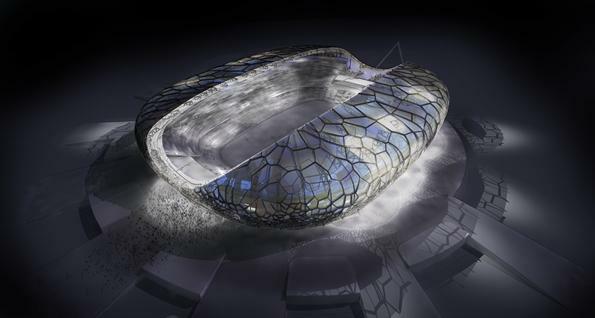 “The main stadium design, in addition to the venue overlay plan we have prepared for the 2014 Games, delivers a wonderful vision for the winter Olympics, and a lasting sustainable legacy for Sochi. Its sweeping form responds to both its coastal location and mountainous backdrop, whilst its crystalline skin engages with its surroundings by day, and provides an iconic representation of the colour and spectacle of the games when illuminated at night. 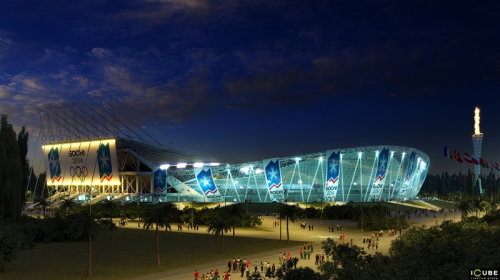 We are proud to be involved on such a level with Olympstroy,” said John Barrow, Populous senior principal. This is the 25th year of Populous’ involvement in Olympic and Paralympic Games, and we are now the first design practice to have been officially appointed for the design of two Olympic Stadiums at one time. With Populous being the architects responsible for the main Stadium and venues overlay for the London 2012 Games, designing for Sochi 2014 ensures the continuation of the practice’s unrivalled experience in Olympic event planning and venue design. Each of these stadiums reflects new standards for Olympic sustainability initiatives. A project of the central Olympic stadium – stadium where opening and closing ceremonies will take place, as well as many medal ceremonies – has been finally selected few days ago. The winner of the tender is a group of companies which includes «Mosproject-4», Russia (architecture design), Populous, USA (architecture design), Botta Management Group, Switzerland (construction management), «ENGEOCOM Association» CJSC, Russia (construction). The stadium must be completed by the end of first quarter of year 2013. After the Olympics it will be used to host football games and comply with all FIFA regulations. Below are a few renderings from icube.ru which list «Mosproject-4» as a client, so, I guess, we’re looking at what future stadium will look like. 75 000 construction workers will be working on Olympic projects in 2010-2011 — this is the estimate from Dmitry Kozak, Vice Prime-Minister of Russia responsible for overseeing Olympics preparations. RIA Novosti also quotes him saying that there are no plans to specifically involve migrant workers, all work places should be filled via competitive transparent tenders. According to him there are only 299 foreign workers are currently working on Olympic construction projects out of around 11 000 people working there today. This is an approximate map for the previous post about new section of the detour road around Sochi‘s central district. Just help to visually understand whats going on. The map was made by user Dali of the forum at allsochi.info. They are promising to complete the road by the end of 2009. Some believe it will solve half traffic problems by routing people who are not going to the Sochi’s Central district around it, which sounds like a great idea. But keep in mind following when you reading about this road in the news: First of, the detour road already exist – yes, it’s in pretty bad condition, but it covers pretty much the same route… and it doesn’t solve anything! Maybe if they fix the existing road and there will be two of them it will help the Center, but I haven’t heard of these plans. Secondly, if they route all the construction vehicles there, as the plan to, this will simply destroy this the road, and the rest of the people will continue going through the center continuing jamming traffic there. And thirdly, I’m glad they’re thinking about Central district, but Adler, where Olympics are planed is in no less, and maybe even in more need to improve road infrastructure… yet I know of very few plans to improve it. One of which is to re-route railroad which currently crosses main road in Adler, and constantly causing traffic jams and interruption in public transport, which goes of route to avoid that place, leaving people in some areas with very few ways to get around. But even fixing this is nowhere near to be enough. 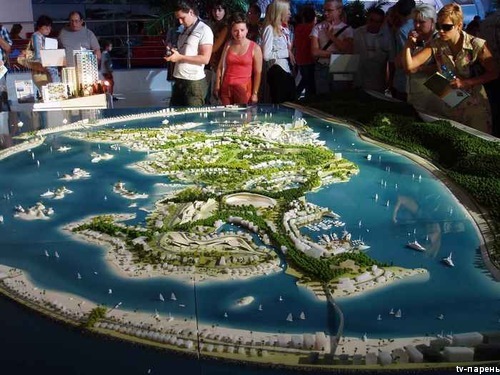 Amid the global financial crisis and the news that many investors are wrapping up their big real estate projects all around Russia and around World, not a single investor withdrew from the already concrete Olympic projects in Sochi – which is good news. However, new investors are not so quick to jump in anymore, so, the promised Government’s financial guarantees will come handy after all, I guess. Georgia, which was one of the first to congratulate Russia on winning the Olympics bid, and who’s president said he supported Sochi bid from the beginning.. Same Georgia which then started a war on the first day of the Olympics in Beijing – something that western media was quick to call “Russian propaganda”, but more recently admitted it was Georgia who started it, and finally even Georgian president admitted giving the order to attack South Ossetia after high ranking Georgian official publicly said the same thing… That same Georgia few days ago tried to appeal to IOC to move Olympics from Sochi to another city – the move that IOC has quickly dismissed. I think now Georgian or Abkhazian question in Sochi Olympics formula is finally closed forever: Georgia attacked Abkhazia (along with Ossetia) → Georgia lost → Russia officially recognized Abkhazia’s independence, which means Abkhazia can help with constructions and will benefit from increased tourism flow to the region → Russian troops will anchor for now in Abkhazia to ensure the region’s stability → IOC acknowledges Sochi is a safe city for the Olympics, the World class event – the cycle is complete for the next decade. Three persons were detained in connection with explosions in Sochi that occurred earlier this year. No details yet, though. 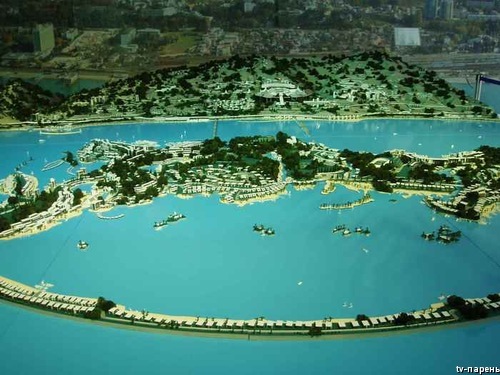 Construction of 17 Olympic projects is already underway, another 100 projects are in the engineering phase, and around 60 more Olympics-related projects are applying for expert evaluation. 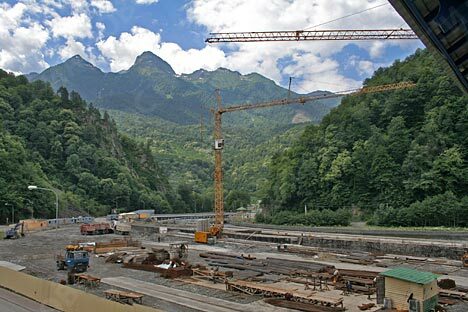 Olympic venues constructions start moves closer to the reality as Sochi administration and the residents of the Imeritinskaya Valley, where the Sochi 2014 Olympic Park will be located, reached compromise on where the residents will be relocated. Russia offered exceptionally compact plan, where all the competition venues would be within 30 miles of each other. It will consist of two parts: mountain region, hosting sliding and skiing events, and sea-side region, where ice venues will be located. The sea-side region will be located in the Imeritinskaya Valley of the Adler district. There were several concerns with this location, the biggest one being a question of what to do with the people who live there now. 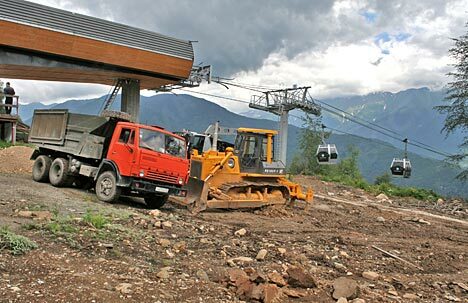 Government has promised to make everyone happy, but with realty prices in Sochi skyrocketing after the successful Olympic bid, residents of “Imeritinka” (as locals call Imeritinskaya Valley) did not trust government to be good to its word. Most recent conflict was in the end of July, when locals did not allow city’s officials to their territory to measure their land. But it appears that long fought battle is over. Earlier Sochi administration officials said that comromise has been reached, and not a single person will be relocated from the areas of Olympic construction without having their social issues taken care of first. And today Alexander Tkachev, governor of Krasnodarski Krai, signed first nine of 138 orders to take over real estate properties for the Olympic construction. The details of the deal are as follows: residents will be able to choose between a new house in the eastern Imeritinskaya Valley build by the city, and a residence paid for by administration. 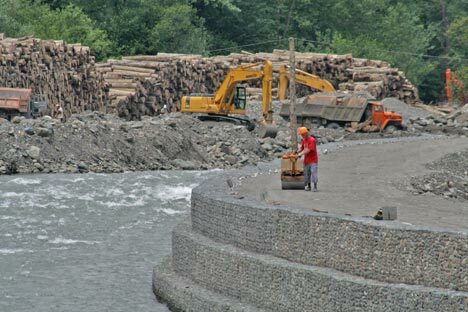 For those who will choose to live in eastern part of Imeritinskaya Valley, the administration is allocating 66 hectares for the real estate properties where brand new houses will be built, as well as all necessary infrastructures. In addition to this, new cultural-historical center will be established to preserve traditions of the Old Believers community who live in Imeritinka as well. It sounds like a really good deal. Especially considering that some parts of the Imeritinka has little to none of basic infrastructure. First nine household will be relocated until the end of this year, while the rest of them during next 1,5-2 years span. Olympstroy, state corporation responsible for coordination of the Olympic construction in Sochi, could not attract investors for some of the Olympic venues. The tender’s deadline was August 8, but there were no proposals for four projects, including the ice arenas. 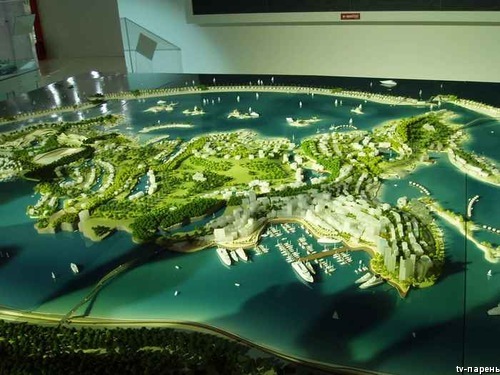 The Olympstroys’ tender projects are tandems of Olympic venue plus hotel(s). Lenta.ru quoting Pokrov Invetment Group’s President saying that pay-off period for hotels can be from eighth years and more, while for the sports venues from 12 years to never. By his calculations sport venue + hotel tandem could take more than 20 years to pay-off. Meanwhile, officials are not surprised about the outcome. The press secretary of the Ministry of Regional Development said that ice arenas in many countries are not paying off and are built on governments’ funds. However, the administration had to try to find private funds for these venues. Now there will be separate tenders for the hotels, while Olympstroy will finance the venue constructions, and run separate tenders for prime contractors for the venues construction. * Sochi mayor Viktor Kolodyazhny resigns to become head of «Olympstroy» corporation owned by state which will control all Olympic related construction in Sochi, and, of course, the money flow. You can read more on this in The Moscow Times. The acting mayor for now will be Vladimir Afanasenkov — Vice Governor of Krasnodarsky Krai. He too was previously involved in Sochi’s Olympic bid. “Sochi 2014 Organising Committee and Russian authorities today began the first ever mass intellectual property protection campaign to safeguard the Olympic brand in Russia. According to preliminary calculations, the sledge and bobsled course to be constructed for Olympic Gmes in Sochi will be longest and fastest in the World. 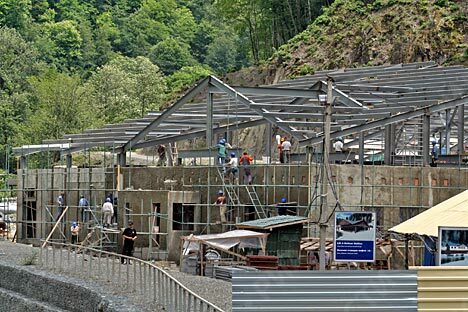 This will be thwe second bobsled course in Russia, the construction of the first one will be completed some time next year near Moscow. Head coach of the Russian bobsled team said that Moscow course will most likely be used mostly for training and testing on new bobsleds, while Sochi’s course will most likely become course for competitions.